Spectacular flowers and brilliant foliage make Hydrangea ‘Snow Queen’ one of the best of all of the hydrangeas. It has a naturally upright habit, fairly broad and rounded. 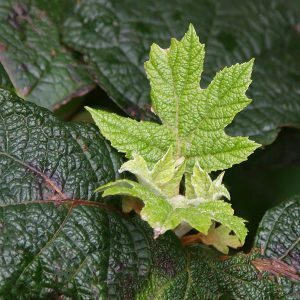 This is a small shrub, described as deciduous, yet for us the autumn foliage of Hydrangea quercifolia ‘Snow Queen’ actually holds right through winter. In spring until it is pushed of by the new. It is a tough plant, to grows well more sun than other Hydrangeas, its flower heads are held upright above the foliage and it is a compact growing plant as well. Over time the plant will reach around 2 metres – 3 metres in height with a similar spread. The flowers appear in large panicles, white, fading to pink as they age. Although this is plant that requires little regular pruning. If required Hydrangea ‘Snow Queen’ can be pruned to size.The best time to prune is immediately after flowering. This allows the plant tom be at its best for the next flowering season. In a humus rich well drained yet moist soil, this is a remarkably hardy plant. In very hot climates, or positions, a little afternoon shade may be required. Fertilise with a general purpose slow release fertiliser in spring. Mulch around the plant to maintain a cool root run. Water during long dry periods in summer. Height – 2 metres to 3 metres. Easily pruned to around 1.5 metres if required. Spread – Around 2 metres. Position – Full sun to a little shade in hot climates. Soil – Humus rich, moist and well drained. Foliage – Good mid green turning to deep red to bronze in autumn. Flowers – White, conical in shape.